Dual-listed conglomerate Press Corporation Limited (PCL) Limited has held its 33rd annual general meeting (AGM) in Blantyre where it declared a final dividend of MK1.5 billion. Speaking at the AGM, PCL Board Chairman Patrick Khembo said the PCL group delivered good results not-withstanding the difficult operating environment that prevailed during the period. “Directors have proposed a final dividend for the year 2016 of MK1.5 billion (2015: MK1.02 billion) representing K12.50 per share (2015; MK8.50 per share). Group consolidated profit after tax was MK17.21 billion (2015 MK12.24 billion) representing a 41% increase year -on-year,” said Khembo. “The slow growth was mainly on account of drought which caused a decline in the agricultural sector for a second season running resulting in about 40% of the population experiencing food security," said Khembo. He added that the weak economic performance was exacerbated by the recurrent power outages which were rampant throughout 2016, severely affecting productivity of all sectors of the economy. “2017 promises to be a better year with an expected growth of 5.6% led by recovery in agricultural production due to a good rainfall season Building on the Group's strength in terms of its size and diversity, focus will be to continue nurturing and consolidating the Group's existing businesses, turning around underperforming companies, while continuing to explore the market for any profitable business opportunities including power generation,” said Khembo. 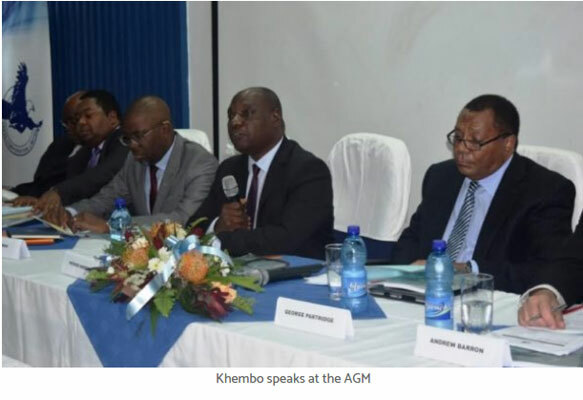 At the AGM, Khembo introduced to the shareholders PCL’s new Group Chief Executive Dr George Partridge who replaced Dr Matthews Chikaonda who retired on December 31, 2016 after sewing the company for 14 years.